It can be tempting to listen to offers from storm chasers, but more often than not they only make matters worse. In our years of experience as one of the leading roofing companies in Northwest Indiana, we’ve had our share of clients who had to call us to correct the problems these storm chasers created. Your roofing is a major investment, and we strongly recommend against taking your chances by hiring storm chasers. Here are tips on how you can protect yourself from them. 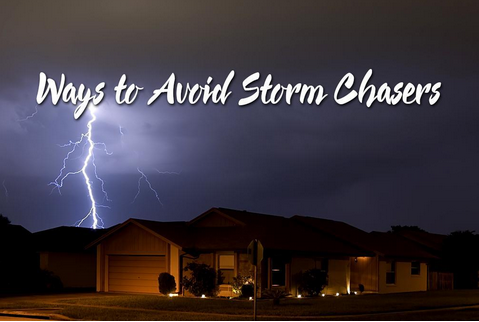 Avoid door-to-door solicitors – Storm chasers do not have physical business addresses that you can visit, and in most cases only work from the back of a truck. This would present a problem if you have workmanship warranty claims or if their work needs to be corrected. Do your research – We understand that your time and resources are limited after an emergency–after all, you have to make sure that your roof is fixed as soon as possible–but you should at least take the time to vet who you will hire. Investigate the business’ rating and reviews on the Better Business Bureau website, call the phone numbers provided on their websites, and ask for references. Every professional roofer in Chicago shouldn’t have a problem providing names and numbers. Ask questions – You should always be present when someone performs inspections on your home. Some of these storm chasers have been known to fake storm damage using hammers or golf balls. They’re also likely to avoid any questions. Professionals like ourselves, on the other hand, will be happy to answer your inquiries and provide an honest appraisal of the roofing damage. Insurance and licensing – Legitimate contractors are fully licensed as required by the state they’re operating in. Insurance should be present in the form of general liability insurance and workers’ compensation. The former is protection from accidental property damage while the latter is protection from accidental workplace injury. If you happen to need emergency assistance for your roofing in Schererville, IN, we encourage you to see the difference and call Rogers Roofing today at (219) 228-8210 or fill out our contact form for a free, no obligation consultation. We look forward to hearing from you.